The Landbay Rental Index, powered by MIAC, underpins the second edition of the National Rent Review published by Landbay in December 2017. The report highlights the trends nationally, regionally and across the counties of the UK during 2017. 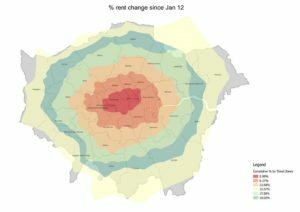 Additional focus is given to the trends in London across the Boroughs and how there is a ‘halo’ effect occurring in price trends using travel zones as a barometer. There is also a feature on Millennials and the top 25 Cities to rent in across the UK based on multiple criteria such as job opportunities and living costs. If you are a BTL lender or portfolio manager get in touch with MIAC for a deeper understanding of the UK rental market using our proprietary solutions.